Over the years, we have established effective cooperation with our suppliers and organizations that collect second hand clothing and companies which supply us with intact high quality original used clothes and shoes to sort. During processing, we sort original clothes on the basis of type, quality and season, with full knowledge of the demands of the purchasers. The finished products are folded up and put into transparent sacks – 30 to 50kg -, larger white sacks -70 to 130 kg – and big pressed bales – 300 to 550 kg, then we store them and sell them. 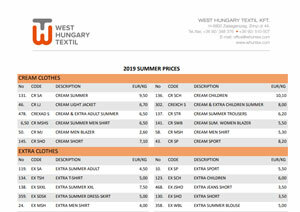 Our super and premium quality products include adult and children clothes, shoes, home textile and accessories sorted according to the taste and requirements of dealers in Hungary and the neighbouring countries. In grades Creme, Super, 1 and 2 we offer 300 different types of products. Parts of our products are sorted from the best quality UK raw material. Clothes for the winter season, shoes and home textile are sorted from high quality German raw materials. We have established good business relations with dealers in the Middle East and Africa, in order to sell them larger quantities of summer clothing. They are mainly interested in branded UK mix of men’s, women’s and children’s clothes, suitable shoes, textile and colourful accessories, such as bags and shawls. The goods are put in big pressed bales or in cap sacks, on demand, and prepared for delivery in containers. We put the shoes in white sacks or cap sacks. In the East, most of all in Pakistan, there is great demand for inexpensive but good quality Western European – mainly UK – used clothes and home textile. Products that we send to these countries are also put in big pressed bales, occasionally in cap sacks. These products are carefully sorted and cheap, they are of dependable quality though. A considerable part of the original clothing collected and purchased in Western Europe – mostly in the UK and Germany, sometimes in Holland, Austria, Slovenia and Switzerland, we offer for sale to our different business partners. Our supply is renewing daily with d2d, school, cash4clothes, container and street collections of intact small bags. In our storehouse, anyone can see the quality of the products and we help them select the items that best suit their requirements. Truckloads are carried straight from the load up site to the perchaser’s site. Due to our technical background and experience, we offer competitive prices, security and guarantee to those who buy newly collected original clothes from us that they need for their work.